This 7.62 NATO ammunition from Federal comes straight from the Lake City Army Ammunition Plant, the same facility that supplies the US military. It follows the M118 specification for sniper ammunition and fires a 175 grain open tip match Sierra MatchKing bullet optimized for superior long-range accuracy. If accuracy is your foremost concern, this excellent load will deliver in all types of 7.62x51 rifles from M-14s and FALs to bolt-action rifles like the Remington 700. These cartridges come in loose packed 500 round cases. 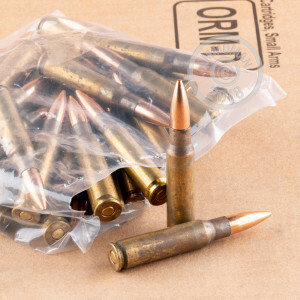 Like other Lake City surplus rounds, they retain visible case-annealing residue per military specifications and use non-corrosive Boxer primers and brass cases. A great way to get premium ammo loaded with MatchKings without paying a MatchKing's ransom! 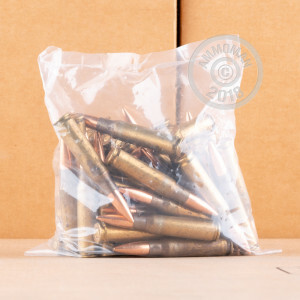 Worried about the cost of shipping a 500 round case of ammo cross-country? Never fear--AmmoMan.com offers free shipping for all orders over $99 including this case! Yes it is not shiny, so what, it shoots 1" to 1.25 " groups at 100 yds from my 18"barrel AR10 dpms at 100 yds.. It is a hotter version of Federal Gold medal match .I chrono it at 2525 fps. from my 18" barrel and guess you could get 2580 from a 24 inch barrel. This is surplus blemished ammo and I would not reccomend. My Ar-10's dont like it and a good percentage of the cases were dented. My M24 shoots this ammo great. My M24 shoots this ammo great. My groups at a 100 yards are less than a 1/2". My Colt LE901-16S suppressed handles this ammo perfectly. At 100 yards it groups less than 1" on average. The brass looks the same as the M855 that we shot in the military. We didn't get polished brass! My 16" 1-12" twist chrome lined barrel was able to stabilize this ammo. Average ammo with tarnished and blemishes on the cases. This product is average at best. It is loose packed and seems to be blemished ammo not suitable for our military. I am not happy with my purchase. My test fires at the range were all over the place and not very accurate. I would not recommend to purchase by a serious shooter.